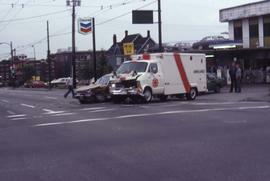 Colour Kodachrome 35mm slide depicts a brown car and an ambulance parked beside each other next to a cross walk, with the front end of both cars smashed in and debris on the road. Colour Kodachrome 35mm slide depicts a car driving past a store called "Aggie's Store" situated along the water. Photograph depicts an automobile parked inside the hollow tree at Stanley Park with three people standing in front.Written on recto: "The Hollow Tree - Stanley Park - Vancouver, B.C."